This weekend, a red Routemaster London bus will be taking some fifty Nairnites on a tour of London. 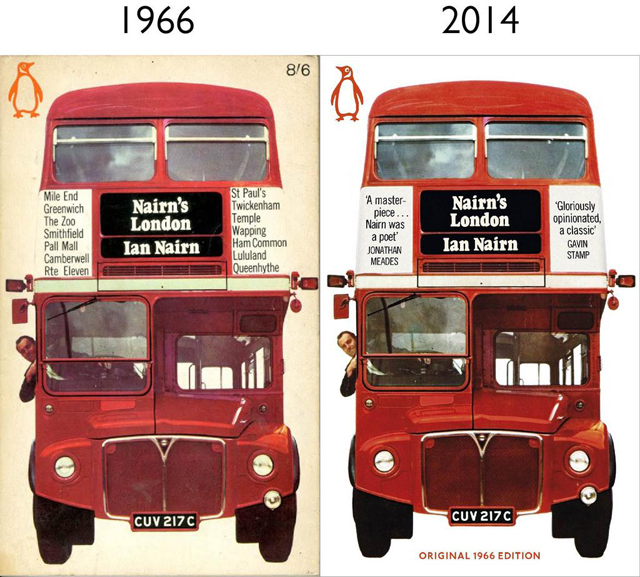 The distinctive cover of Nairn’s London has been faithfully reproduced by Penguin. It shows the author leaning out of the cab of a red Routemaster London bus, registration number CUV 217C. David Collard has discovered that this very vehicle still exits, and is available for hire. So, on 30th November, this hallowed bus will be taking some fifty Nairnites on a tour of London, beginning with Spiegelhalter’s shop in the Miles End Road – “one of the best visual jokes in London,a perennial triumph for the little man, the bloke who won’t conform” – and ending at one of the many, many pubs that Nairn loved, and were his undoing. Gavin Stamp argues for the careful rebuilding of The Glasgow School of Art after a devastating fire.